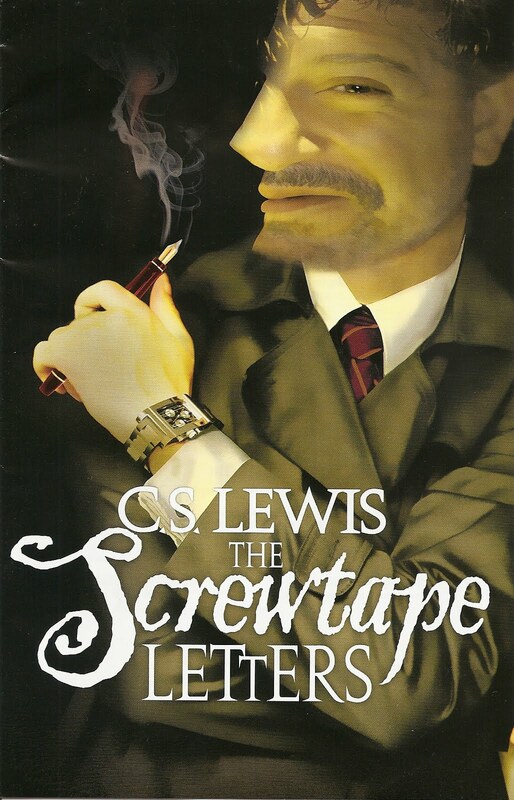 "The Screwtape Letters" is a satirical work comprised of the letters between "Screwtape", a senior demon and his nephew, a demon in training named "Wormwood." I have never read the book, so this is a review of the play as presented by the Fellowship for the Performing Arts at The Knight Theater here in Charlotte. The original work took place in wartime London, and centers about Screwtape and his nephew, the ill fated Wormwood. Screwtape is mentoring his nephew as the younger Demon attempts to tempt an ordinary man, named "The Patient", into a life which will take him straight to Hell. This should be very simple, according to Screwtape, but as the younger Wormwood learns, is not as easy as it seems. The Patient to which he has been assigned comes from a good family, has an education and falls in love with a Christian woman. In short order he becomes a Church going, God fearing Christian, much to the dismay of Scewtape, who has been charged with training his nephew to corrupt The Patient's life in order to alleviate the hunger for new souls in Hell. At times comical, and others pensive and revealing, the play explores the hypocrisy and false promise of both Heaven and Hell. On the one hand there is Screwtape, who serves the Devil by tempting people to ruin their own lives in order to gain their souls for himself. And on the other hand, there is Heaven, with it's promises of everlasting Peace and Love. Can one be real, while the other is merely an illusion? What is the purpose of the struggle in which we all live daily? To Screwtape and Wormwood, greed and self interest are seen as virtues, while The Patient is drawn steadily into a world of Love and Self Sacrifice. When the Patient becomes a Christian, Screwtape is furious with his nephew, but still holds out hope that the hypocrisy of the Church will lead him to Hell. After all, as Screwtape explains, "The safest path to Hell is the gradual one." It is not necessary to have The Patient commit some horrendous deed to obtain his soul. A slight, but constant, chipping away at his morals should suffice. Ultimately, Wormwood fails in his mission, as The Patient goes off to war and dies for a glorious cause. Screwtape is inconsolable, war is the worst enemy of the Devil. During wars, when both sides think they have the right of it, each side implores God for Victory. When confronted with tragedy, humans tend to do "good works" and help one another. This is just what Screwtape does not want. Max McLean, as Screwtape, is impeccable. His diction, timing and poise are incredible and give creedence to his place as one of the world's greatest living narrators. The adaptation was done by Jeffrey Fiske, a former NASA consultant and Drew University Professor. Of intersting note is that at the conclusion of the play, Mr. McLean stepped forward, out of character, and implored that we remember that he is not really Screwtape. He then invited the audience to remain for an ad hoc discussion of the presentation.